All too often, our intentions to enter many items into the WeeTRADE system are side-lined because, well, life happens. Months before the sale, we are thinking of all the clothes, toys and shoes we will sell at the next sale. We try- we really do- to get organized ahead of schedule. We wash and sort and pile after the holidays and tell ourselves that we will get the items entered earlier this year- not waiting until the midnight deadline this time. I am happy to tell you all about the new Mobile option for entering items! No longer do you need to fire up your laptop to enter in your WeeTRADE items! It can all be done from your phone! No fancy app or software you need to download- in fact, it is located in the same spot on the WeeTRADE website. Here are the very easy, step by step instructions! Step 1: Go to the website, weetradekids.com from your phone. Find the 3 lines in the top right corner and click on them. The drop down menu will appear. Select Consignor Login. Step 2: Enter your Cosignor Number and Password. Step 3: Now you will be on the Consignor Homepage. 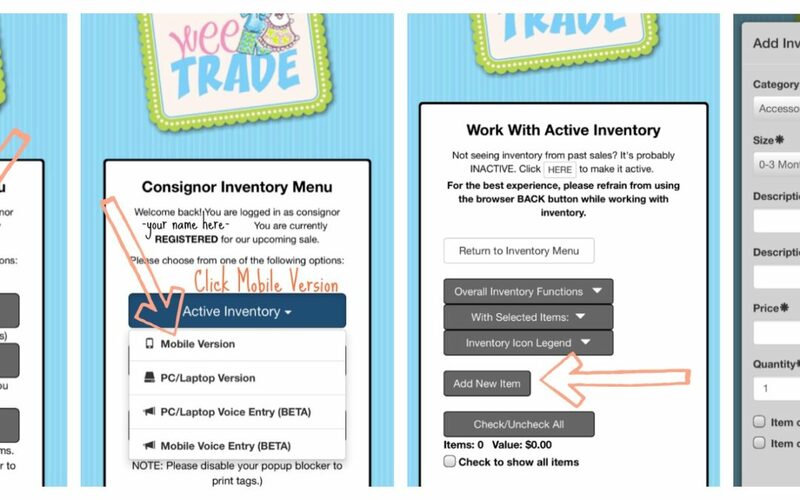 Step 5: Click on Active Inventory. Jessica the WeeTRADE blogger is a real mom, consignor and shopper. She first visited WeeTRADE in 2008 after the birth of her twin niece and nephew and has been hooked on the deals she has found ever since. Jessica has been spreading the WeeTRADE gospel of savings all over Northeast Florida. She is also one of the original Mommy Bloggers for the Jacksonville Moms Blog. She is here to help with real life, real mom advice on selling and shopping the WeeTRADE events! Jessica lives in Jacksonville with her husband Melvin, daughter Lily and son Henry.